A dear friend of mine, who is also a wonderful preschool teacher, told me about this book, and now I reread it every time I need to feel brave about something. It’s not just for kids; grown-ups feel scared too, and this book is all about the “keep trying” that makes being brave possible. Waber, Bernard. 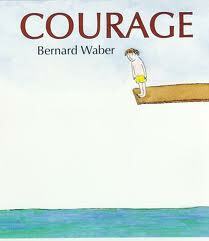 Courage. Houghton Mifflin Books: New York, 2002. 40 pp. Ages 4-8. ISBN 978-0618238552. If you like this book, try Lyle, Lyle Crocodile by the same author, or Spaghetti in a Hotdog Bun by Maria Dismondy.